There are many factors that influence the growth and maintenance of healthy hair, including diet, lifestyle, and hair-care habits. While menopause can cause brittle or thin hair and even hair loss, there are some things you can do to prevent it. While occasional and responsible use of hair products is unlikely to dramatically affect hair health, overuse of hair dyes and heat products can worsen hair loss. Many dyes contain lead, which can cause scalp irritation. Likewise, bleach contains harsh chemicals that dry out the hair and make breakage more likely. In addition, heat products, like straighteners, curling irons, and hairdryers, deeply penetrate and damage hair shafts. Even tightly-pulled hairstyles put strain on the hair follicles and intensify hair loss. Limiting harsh treatments will help improve the thickness and condition of your hair. Nourish your hair by applying herbal moisturizers with nutrients to replenish damaged hair. Sources of vitamin E naturally moisturize hair shafts and contain antioxidants to boost follicle health. Try applying avocado, coconut oil, or olive oil twice-weekly to achieve this effect. The primary function of iron is to carry oxygen in the bloodstream. Increasing your intake of iron by eating more red meat, poultry, nuts, seeds, and legumes will boost blood circulation to the scalp to stimulate hair regrowth. Have a citrus fruit to accompany your iron sources, since vitamin C enhances iron absorption in the body. Hair growth and health is influenced by your well-being, so stress, anxiety, or depression can cause or intensify hair loss or thinning. Find positive ways to combat your stress by incorporating relaxing activities into your daily routine. These may include yoga, meditation, exercise, or socializing - whatever helps you to feel content and stress-free. 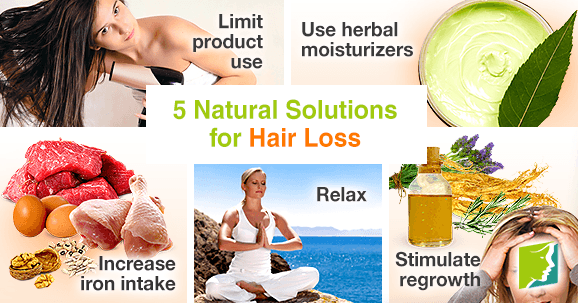 Certain herbal supplements have properties that can stimulate hair regrowth. A combination of ginseng, lavender, and rosemary oils can help: ginseng promotes blood circulation, lavender stimulates the hair follicles, and rosemary has anti-androgenic functions to help regulate the hormonal imbalances causing hair loss during menopause. Massaging these oils gently into the scalp using your fingertips will further enhance blood circulation. Finding natural solutions for hair loss will go a long way in combating the symptom, but it may take time for the hair to regrow. If you are concerned about your hair loss or other menopause symptoms, talk to your doctor.